Learning how to make historical costumes can be useful for various events: reenactments, school plays, even book reports. For beginners, however, it’s difficult to know where to start. Elaborate dresses from movies can be wonderful sources for inspiration, but attempting one of those on a first try is as ambitious as replicating a Van Gogh without previous painting experience. Just as one needs to learn the basics of brush strokes and blending to paint, a costumer needs to learn the basic regarding fabrics and styles of clothing worn during the specified era. This is an introduction and resource for those interested in 18th century France, the time of Marie Antoinette, Victor Hugo, Versailles, peasants and a glamorous aristocracy. This guide includes the basics on what clothing was worn by both women and men, images, and a list of instructional and contextual resources. The period leading up to the French Revolution of 1789 was marked by civil unrest and social turbulence. There was a stark line drawn between the lavish lives of the aristocracy and the utter squalor of the peasant class. The peasants faced rising food prices, harsh feudal system laws, and heavy taxes. The aristocrats, on the other hand, threw extravagant parties, filled their residences with ornate décor, and spent without a second thought. France’s King Louis XVI was spending exorbitantly, as well. On a national level, he put the country into great debt due to its participation in the American Revolution. On a more personal level, King Louis did everything he could to meet the excessive demands of his ostentatious wife, Queen Marie Antoinette. Marie Antoinette turned her palace of Versailles into a paradise removed from the troubles of the real world. It was so far removed, in fact, that most of the members of her royal court were completely unaware that the peasants were learning about Enlightenment ideals and that their country was on the verge of revolution. Marie Antoinette was the trendsetter for her time, and women of the royal court tried to imitate her style. They chose the most glamorous fabrics they could get their hands on. Peasant women were not granted the luxuries of time or money for fashionable clothing, so they often wore the same items day after day. They had to select clothing for function rather than fashion. Some pieces of clothing were worn by the rich and by the poor, while others were reserved only for the wealthiest of women. The following list describes important items worn by women of the period. We have included pronunciation guides for some pieces. Daily bathing was not customary at this time in France, so a woman would first put on a chemise under her dress, like a slip, to protect the outer garment from body oils and sweat. A chemise, also known as a smock, was usually made out of linen or cotton. While both peasants and aristocrats wore the chemise, the wealthier a woman was, the whiter (and more expensive) the fabric was. The neckline during this period was low cut with elbow length sleeves and a mid-calf length skirt. Stays, or corsets, were worn by both classes of women. A stay was worn over the chemise and laced up to give the body shape. The ideal shape was one similar to a cone with tiniest part being the woman’s waist. Because full hips were a desirable feature at the time, a tiny waist would give the illusion that a woman’s hips were even wider. Stays were often reinforced with whale bone or other stiff materials to maintain structure. In the earlier years, stays had shoulder straps, but they were made strapless as the years progressed and cut higher in the armpits. The pannier was similar to a hoop skirt. It was worn by aristocratic women to give their hips a puffed appearance while leaving their fronts and behinds flat. The size of a pannier ranged from modest to extreme, with the largest sizes reserved for special occasions. 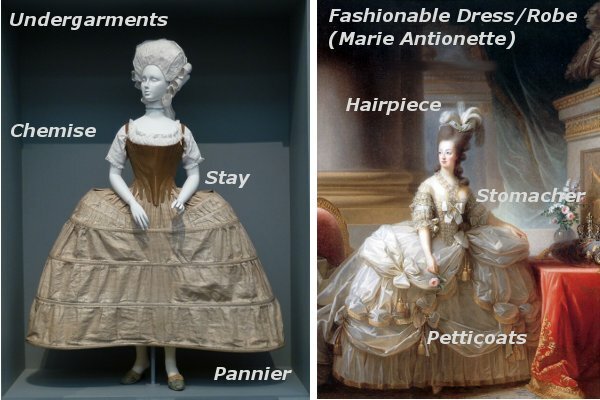 Marie Antoinette was known to wear alarmingly large panniers under her dresses. It was even said that doorways had to be widened to accommodate women’s large skirts. Panniers were made from whale boning or wood. Petticoats were must-have skirts for both peasant women and wealthy women. They could be worn as underwear or outerwear. Petticoats would tie in front and back or have draw-string waists. French petticoats were shorter than those in England or America, falling at about mid-calf, and were seen as scandalous by foreigners. The shorter length had a purpose. For peasants, it was much easier to work without skirts to trip over. For the wealthy, shorter skirts showed off fancy shoes and stockings. Petticoats could be made of colored fabric, depending on the dress worn. The material was usually some sort of linen; wool was common for peasants. A fashionable dress (also called a robe) during this period would feature a tight, pointed bodice with a low-cut, square neckline that was usually edged in lace if one could afford it. The center of the bodice would include a stomacher for decoration. A stomacher was a firm, stiff panel which covered the lower bosom and stomach. Stomachers could either be sewn into the bodice, or attached with pins, laces, or hooks and eyes. The skirt of the dress would be attached to the bodice and decorated with ruffles and garlands. The skirt would cover the behind but would be open in the front to reveal the petticoats worn underneath the dress. Sleeves were approximately elbow-length during this time with lace flounces on the ends. In later years, the chemise gown became popular. The chemise gown was a plain dress with a bodice, high waist, and a straight skirt of light flowing fabric. It resembled a Greek Goddess style of dress. Women’s shoes were usually made out of leather or fabric; wealthy women sometimes wore silk-covered shoes. Shoes had sharply pointed toes and high curved heels. They could be backless slippers (mules) or regular closed footwear. Shoe buckles were worn by the aristocracy for decoration, specifically for parties and balls. Hairstyles were very important to women. Women in the royal court went to great lengths, literally, to style their hair. As a general rule, bigger was better, especially for important occasions. Marie Antoinette wore her hair 3 feet high at times. Women adorned their up-dos with feathers, baubles, and other ornaments. Also common were hairpieces and wigs, which further contributed to hairstyle heights. It was often difficult for women to get around in carriages, as their hair was so large. It was not uncommon for women to kneel on carriage floors or stick their head out of windows while traveling in order to accommodate their elaborate hairstyles. 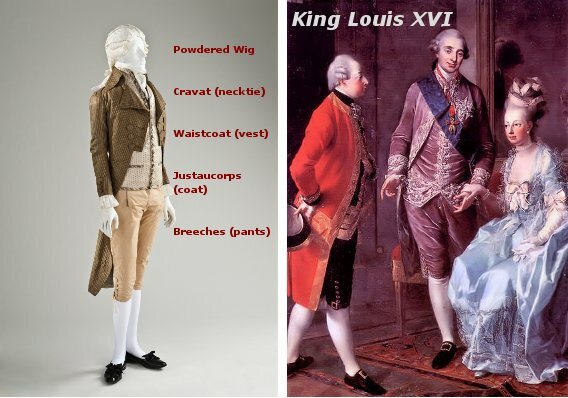 Men with extravagant lifestyles and men with impoverished lifestyles wore similar clothing during this time period. However, much like women’s fashion, it was not specific clothing items but fabric and materials that made the distinction between social classes. A man’s shirt was a wardrobe staple and one of the first layers of clothing worn. A shirt was made of white or cream colored linen with long, full sleeves with cuffs. The shirt pulled over the head, was slit down to mid-chest, and closed at the throat with a few buttons. The shape of the collar was determined by the style of the cravat (a type of necktie) worn with the shirt. For wealthy men, opening slits and wrist cuffs were embellished with ruffles. Shirt lengths for men were quite long, falling to around mid thigh. The shirt may also have been worn to sleep. Breeches were form-fitting pants that buttoned just below the knee. Fall front breeches were the most common style worn. They were called fall front, because they had a flap on the front of the pants that fastened shut. Men of all social classes wore breeches, so they were made with many different types of fabric including linen, cotton, and wool. A cravat was a piece of fabric worn around the neck that was tied loosely in front. It was made of white linen that was often decorated with ruffles or lace. Cravats could be tied in different ways to create different looks. Cravats could be worn for dress or with casual attire..
All men wore some sort of coat, usually called a justaucorps. This style of coat changed throughout the 18th century. During this particular time period, though, the coat was shorter and the skirt of it less full. It hung down long in back and shorter in front to reveal the breeches. There were many buttons running down the front, although it was usually left open. Men almost always wore waistcoats (vests). A waistcoat was worn under the justaucorps and could be made of linen, silk, cotton or wool. It buttoned down the front, opened into an upside down “V” shape beneath the stomach, and had two pockets. Men’s shoes, like women’s, were made from leather or fabric and sometimes silk. Shoes of wealthier men usually had decorative buckles on the front and were worn with high stockings that reached up to the knee. Men also wore high boots in place of the stockings and traditional shoes. Men usually wore powdered wigs with curls that tied at the back with a ribbon. Although men’s hairstyles were not as large as women’s of the time, they were still very important in showing off social status. Men also wore tricorn hats. There's even a Costume College that takes place annually in California. Check out bauhausfrau's flickr photostream and be amazed. This post was written by Tonja Thompson, a HalloweenCostumes.com writer. Tonja has a degree in history from Minnesota State University, Mankato. Love this! Looks so awesome!